The Nissan Figaro is a front-engine, front-wheel drive, retro-styled two-door, 2+2, fixed-profile convertible manufactured by Nissan for model year 1991, and marketed in Japan at Nissan Cherry Stores. With its design variously attributed to Naoki Sakai and/or Shoji Takahashi, 20,000 examples were marketed by Nissan in the convertible's single year of production — all with right hand drive. Because of its origins at Pike Factory, Nissan's special project group, the Figaro (along with the Nissan Pao, Be-1 and S-Cargo) are known as Nissan's "Pike cars," and represented a design strategy that adapted "design and marketing strategies from other industries like personal electronics." In 2011, noted design critic Phil Patton, writing for the New York Times, called the Pike cars "the height of postmodernism" and "unabashedly retro, promiscuously combining elements of the Citroën 2CV, Renault 4, Mini and Fiat 500." Nissan introduced the Figaro at the 1989 Tokyo Motor Show, using "Back to the Future" as its marketing tagline. As a fixed-profile convertible, the upper side elements of the Figaro's bodywork remain fixed, while its fabric soft top retracts in conjunction with a solid panel with a defroster-equipped glass rear window. The fixed-profile concept is seen on other convertibles, including the Vespa 400 (1957), Citroën 2CV (1948–1990), the Nash Rambler Convertible "Landau" Coupe (1950), and the 1957 Fiat 500 — as well its 2007 Fiat 500 successor. Based on the Nissan March platform, the Figaro uses a 1.0-liter (987 cc) turbocharged engine generating 76 hp (57 kW; 77 PS) and 78 lb⋅ft (106 N⋅m) of torque through a 3-speed automatic transmission, front MacPherson struts, rear four-link coil spring suspension; rack and pinion steering, front ventilated disc and rear drum brakes. The Figaro can reach a top speed of 106 mph (170.59 km/h). Weight saving front fenders are thermoplastic resin. 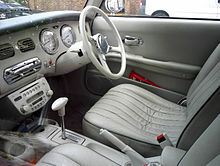 Standard equipment included ivory leather seats with contrasting piping, air conditioning, CD player, chrome and Bakelite-style knobs, soft-feel paint on the dashboard top, chrome-trimmed speedometer with smaller inset gauges for fuel and engine temperature; and chrome-trimmed tachometer with inset clock. The four available exterior paint colors represent the four seasons: Topaz Mist (Autumn), Emerald Green (Spring), Pale Aqua (Summer) and Lapis Grey (Winter). 8,000 Figaros were originally manufactured, with an additional 12,000 subsequently manufactured to meet demand. Prospective purchasers entered a lottery to purchase a Figaro. Limited edition cars came with passenger side baskets and cup holders. As of 2018, more than 3,000 of the cars were registered as being in active use in Britain. ^ a b Brendan McAleer (July 28, 2015). "No matter how you slice it, the pint-sized Nissan Figaro is just plain fun". Driving.CA. ^ a b c d Phil Patton (March 18, 2011). "Nissan's Cartoon Cars, Once So Hip". The New York Times. ^ A.J. Baime (April 19, 2016). "How a Nissan Figaro Became an Instant Classic in the U.S." The Wall Street Journal. ^ Jim Cherry (May 7, 2010). "1991 Nissan Figaro: Back to the future in Pee Wee Herman's dream car". The Examiner.com. ^ a b c d Larry Printz (June 21, 2018). "Why you should want the adorable Nissan Figaro". Hagerty.com. ^ Cars, Duncan Imports and Classic. "Nissan Figaro for Sale | Nissan Figaro 1991 | Nissan Figaro USA". www.duncanimports.com. Retrieved 2019-01-01. ^ a b Pérez-Peña, Richard (January 11, 2019). "This Quirky Car Is Japanese. But There's 'Something Very British' About It". The New York Times. ISSN 0362-4331. Retrieved January 12, 2019.